Sustainability is at the heart of our organisation because we are here to develop Dubai’s business community by delivering products and services designed to represent, support and protect their interests both now and in the future. 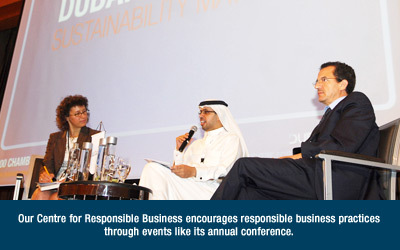 One way we do this is through our Centre for Responsible Business, which assists Dubai businesses in acting responsibly and adopting high social, environmental and ethical standards. 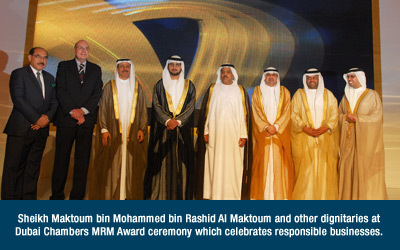 Our Mohammed bin Rashid Al Maktoum Business Award is another way in which we seek to support and encourage excellence and responsible business practices among our members. We also seek the same with our suppliers by applying our Sustainable Procurement Policy and working with them to source socially and environmentally responsible solutions. For a better experience, please use portrait orientation.